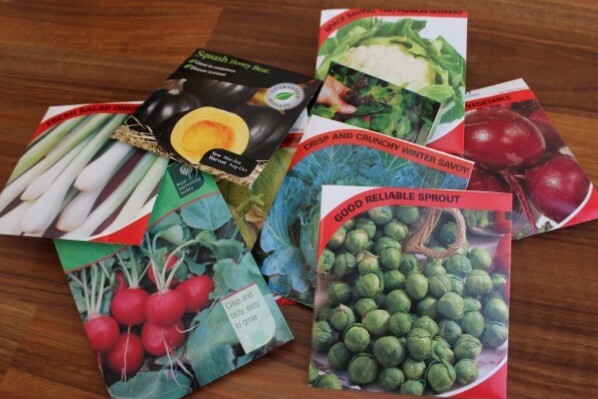 If you haven’t done so already, now is the time to choose and buy your vegetable seeds for the year ahead (flowers too, of course, but I’m focusing on the veggies today). For me, that means dusting down the old biscuit tin in the shed containing the seed packets from last year and checking the sow-by dates, taking stock of what I’ve got left and then making the tricky decision of what to grow this year. I say ‘tricky’ because I tend to want to grow pretty much everything, but I don’t have the room. Having said that, nearly all vegetables can be grown in pots (sweetcorn and Jerusalem artichokes excepted) … and I can always buy another pot! (1) Grow what you like to eat! 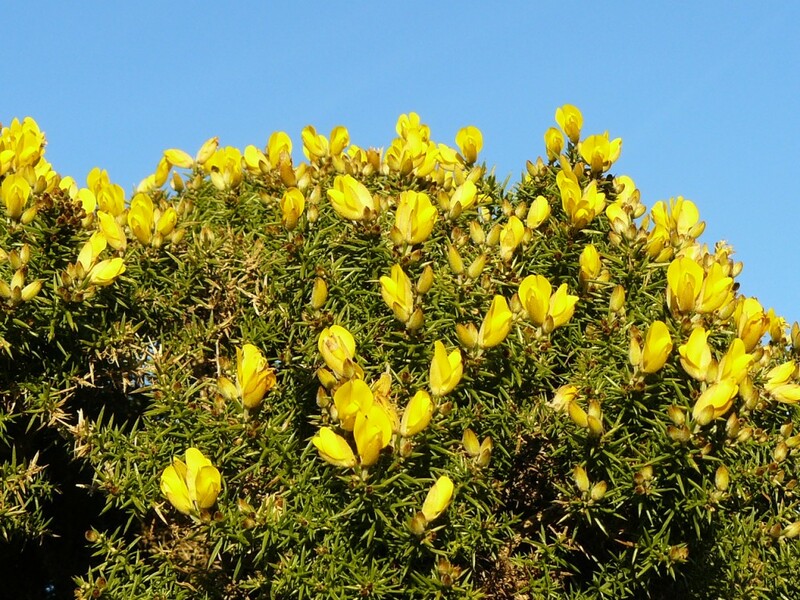 It might sound daft, but you’ll be surprised how many people grow things they don’t really like. I made this mistake with a crop of Swiss Chard a couple of years ago. It grew well (so I ended up with stacks of it), and it looked pretty, but I didn’t really like the taste of it that much and most of the leaves ended up in the compost. (2) Consider the economics. If you don’t have a massive plot, be money-wise. Some vegetables are simply cheaper to buy and no amount of gardening savvy will produce a cost-saving benefit. So grow high-value vegetables and buy the cheap ones. I’m always amazed at how much a bag of mixed salad leaves costs in the supermarket. It’s such a good feeling to see them growing rampant in pots on my patio for a fraction of the price. French beans are another money saver in our house. (3) Make some ‘easy-grow’ choices, particularly if you are new to vegetable growing (my ‘sure things’ are baby carrots and beetroot). That way, if your parsnips don’t germinate or the caterpillars eat all your cabbages you’ll still be pulling up some fresh veg with a smug smile and won’t be completely despondent at the end of the season. (4) Check the growing times. If you don’t want to wait until Christmas to harvest your brussel sprouts, or next year for your purple sprouting broccoli, then choose vegetables that will provide ‘instant’ gratification. Lettuce, radishes, baby carrots and courgettes are all good options. (5) Match your veg to your garden. Think about where you will be growing the vegetables. For example, if you have heavy clay soil (like me), long-rooted carrots or parsnips will struggle, so choose the stumpier varieties or grow them in pots in lighter compost. If your garden is shady, avoid growing sun lovers like tomatoes and beetroot; grow leafy veg instead. If you don’t have a lot of room, try dwarf varieties (I was over the moon with my dwarf runner beans last year) or ‘mini veg’ that you can grow in closer proximity to each other. (6) Try something different. It’s quite exciting to grow something that you haven’t eaten before, or that you’re unlikely to find in the shops. Last year I grew some baby squash – and they were delicious! It’s a good idea to make a list of what you’ve got, what you need to buy, and where you’re going to grow it. 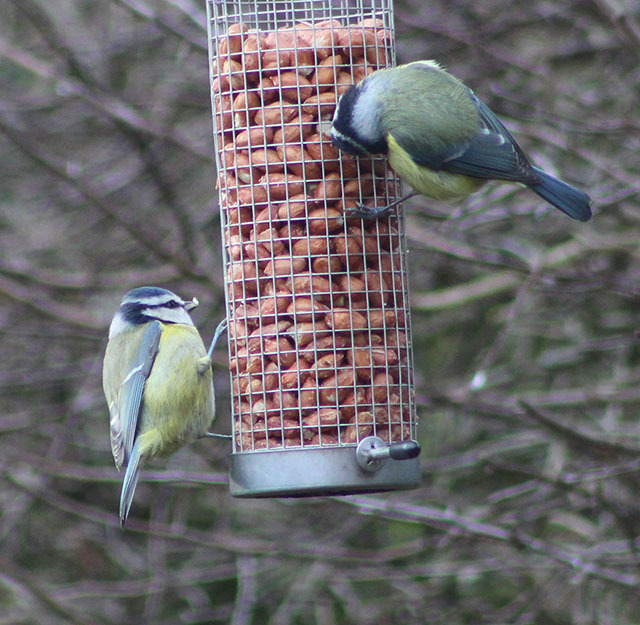 There are lots of seed suppliers out there. 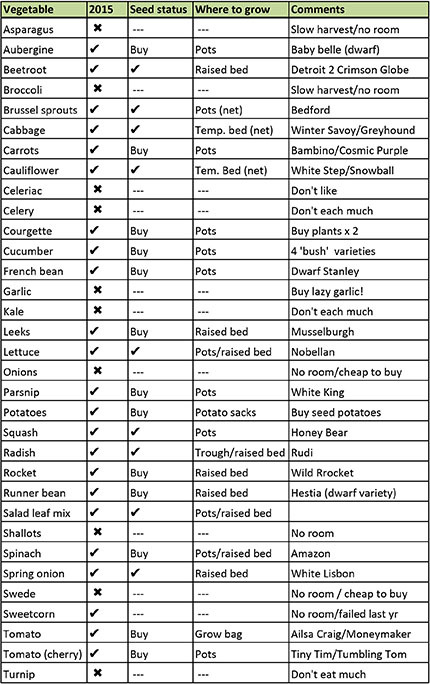 To avoid getting overwhelmed by it all, my advice is to check out the information from 2 or 3 reputable ones (you don’t want dud seeds!) before making your selection. 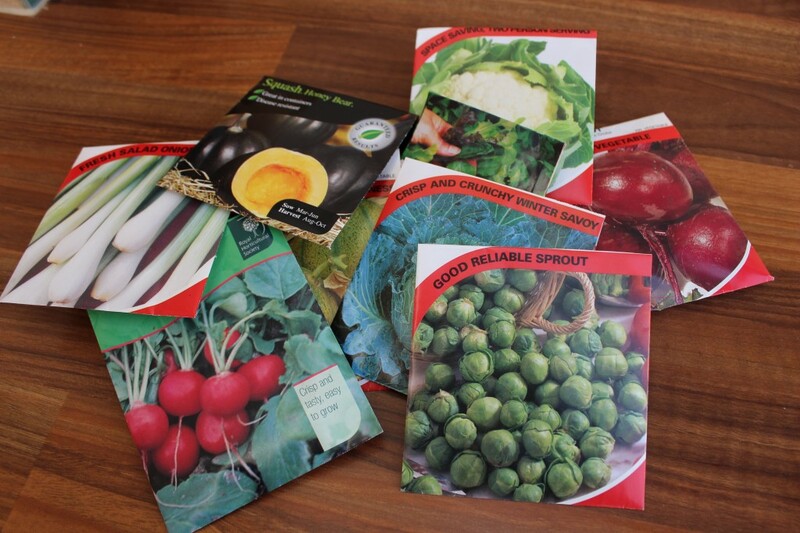 One of winter’s great pleasures is kicking back with a cup of coffee or a glass of wine, perusing your seed catalogues or information online, sending your order off and then fantasizing about how your garden will look in the summer, bursting with your very own supply of fresh healthy veg. I’d love to hear what you’re planning to grow this year. And all tips welcome! Please leave a comment below. Over the past couple of days, blustery winds (reaching speeds of over 100 mph in some places) have wreaked havoc, bringing down roof tiles, power lines and trees. Those same winds have also made a lot more leaves available to gardeners around the country. 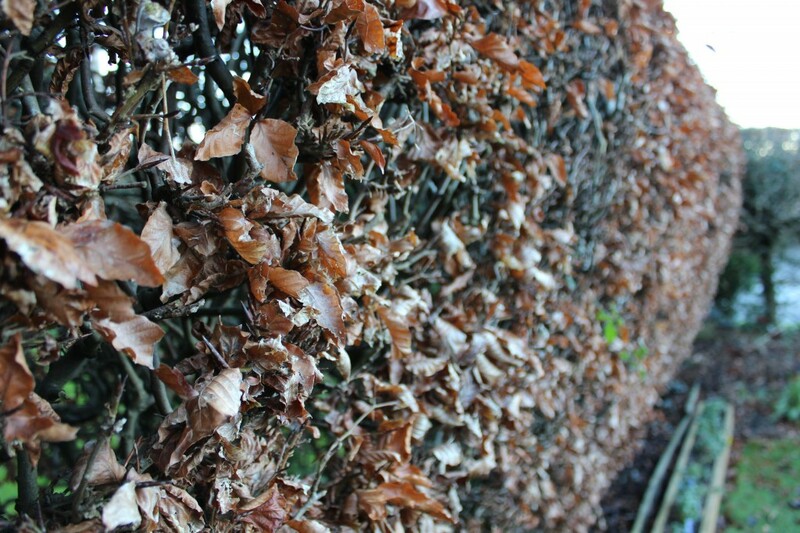 Even the beech hedge in my front garden, which always hangs on to its crispy curled russet glory well into the Spring, has begun to loosen its grip a little. So why do gardeners get so excited about fallen leaves? The answer: free soil conditioner! 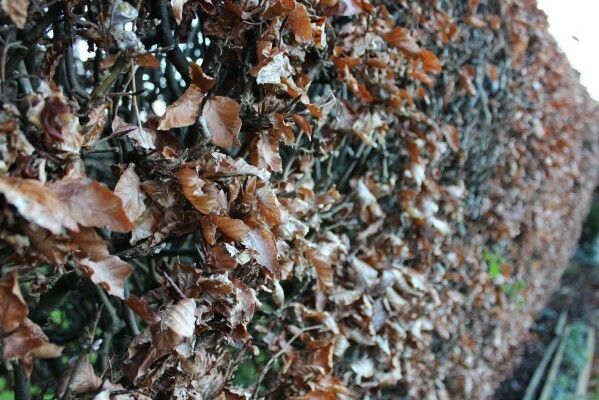 Beech leaves (as well as oak, alder and hornbeam) break down pretty easily and produce a good quality leaf mould; sycamore and horse chestnut, for example, take a little longer. 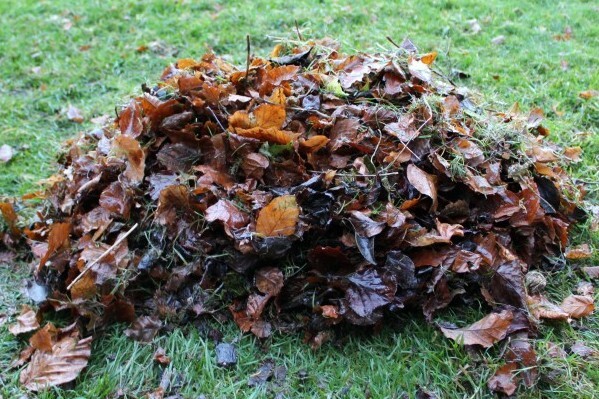 Leaf mould greatly improves the structure and water-holding capacity of the soil, and provides the perfect conditions for all the beneficial organisms that dwell there. Given the dearth of other jobs in the garden at the moment, I actually welcomed 15 minutes of raking. It got me out in the (very) fresh air, away from my desk, and provided me with a surprisingly decent mini workout. 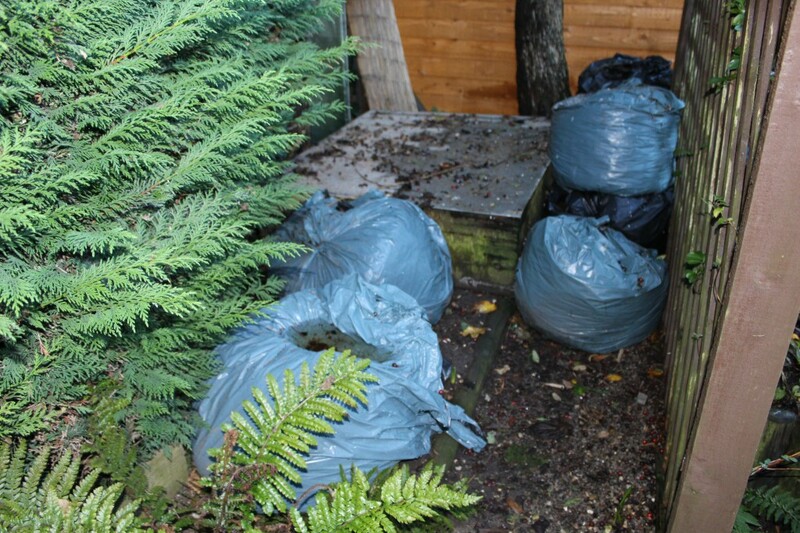 After 15 minutes I had produced a neat pile of soggy leaves ready to be be bagged and stored until the autumn. 15 minutes of raking … et voila! 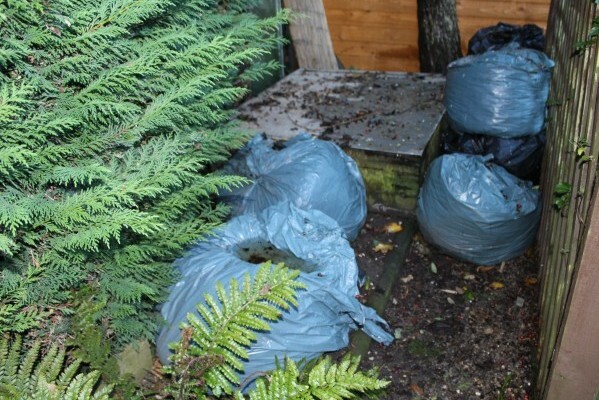 Simply put the leaves in a bin bag, moisten them if dry and stab a couple of holes in the bottom for drainage. Then loosely tie up the top of the bags and store out of sight in a shady spot for the rest of the year. 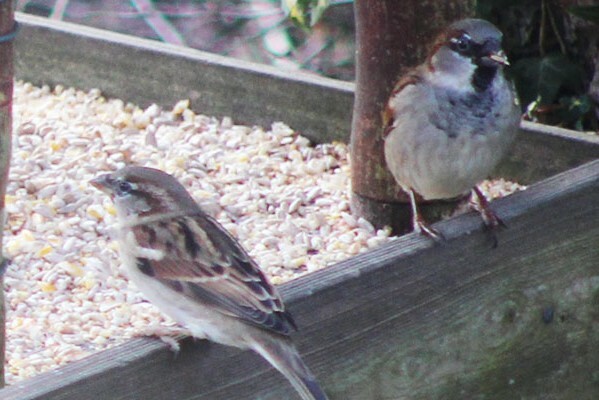 Alternatively, if you’ve got plenty of room – and a lot of leaves – then you could build a leaf bin, a simple cage-like structure, with walls comprised of chicken wire, stapled onto stakes hammered into the ground at four corners. Position it somewhere sheltered, so the leaves don’t blow away, and keep it moist. After 1 year you’ll have a decent leaf mulch to use as a top dressing for the garden in winter. If you’ve got the patience to wait 2 years (unlikely in my case! ), then you’ll end up with an even crumblier product that you can use as a soil conditioner, or even as seed-sowing compost. The downside is that you need the room to hide a load of unsightly bin bags, or to put a bin. 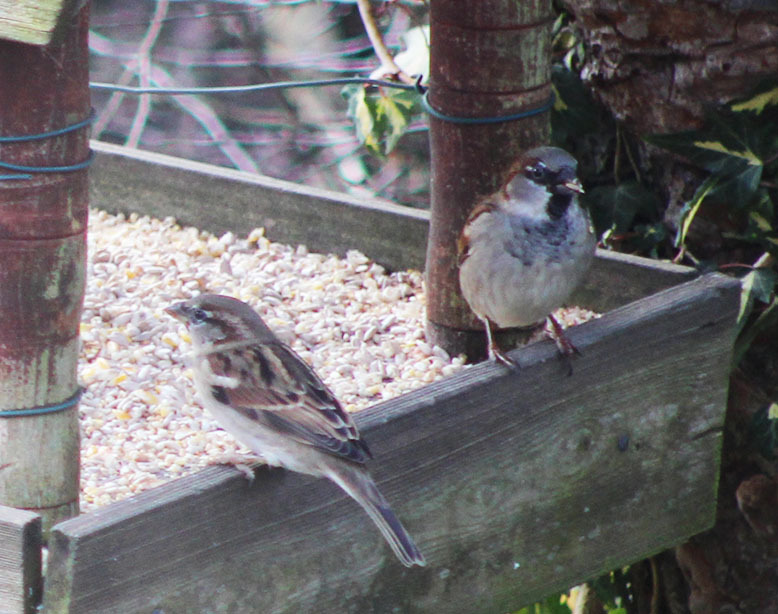 I happen to have a shady corner at the bottom of the garden next to one of my compost bins that is hidden by a trellis. If you haven’t got that kind of room, don’t waste your leaves. Add them to your compost instead; they are an excellent source of ‘brown’ material. For more information on ‘greens’ and ‘browns’ see Compost composition. Everyone talks about January being the bleakest of months, and for the most part it is pretty grey and dreary. So when the sun emerges and the sky turns blue … get out there! 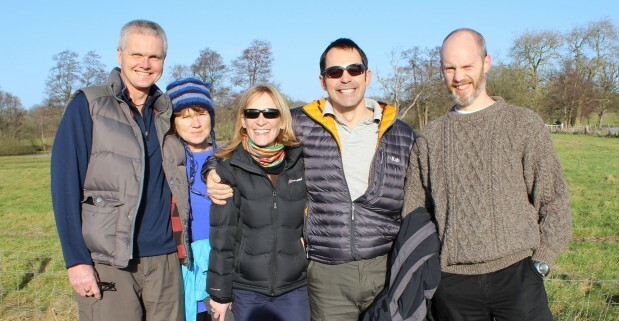 Last Sunday, the wind dropped and the sun shone over Hampshire, so we laced up our walking boots and set off – with friends – along a (very) muddy footpath out of Odiham. 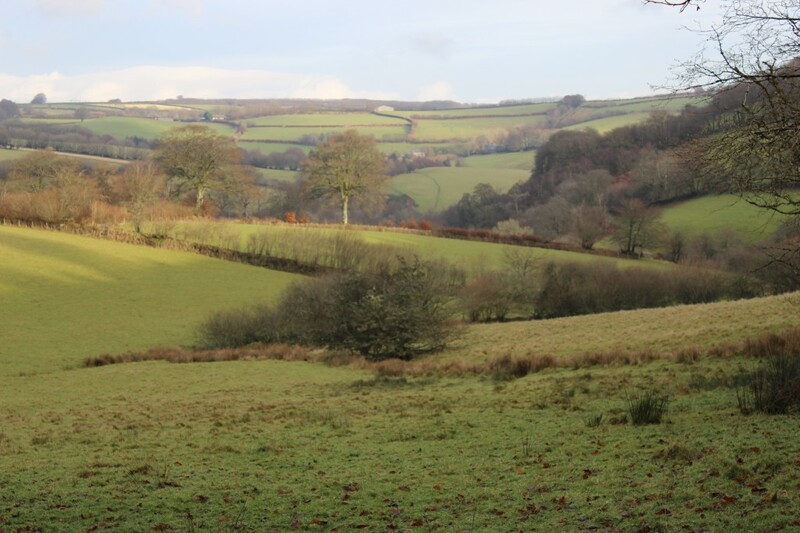 After our new year Exmoor exploits, the beauty of this walk was …. no hills! 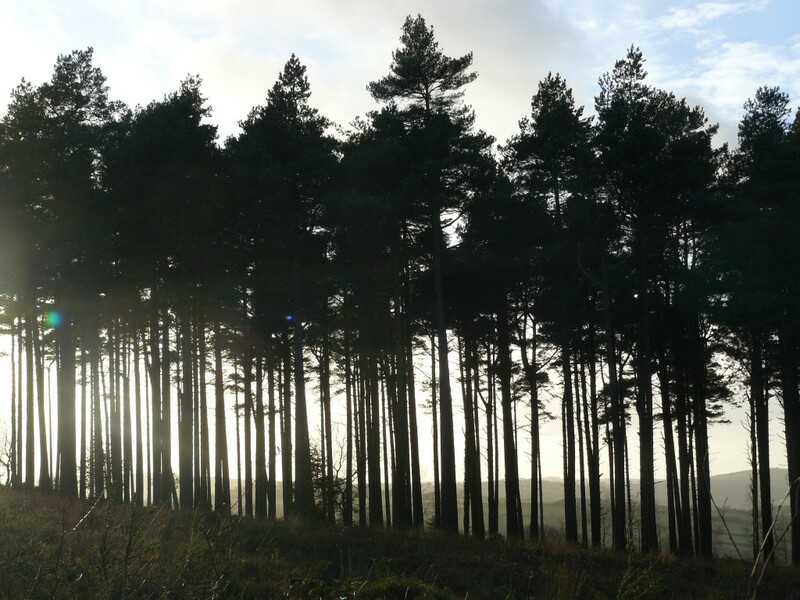 We tramped over squelchy fields and through waterlogged woodland up to the Farnham road (A287), crossing over the busy thoroughfare to pass between two lodges, which were previously the gatehouses to the Dogmersfield Park Estate. 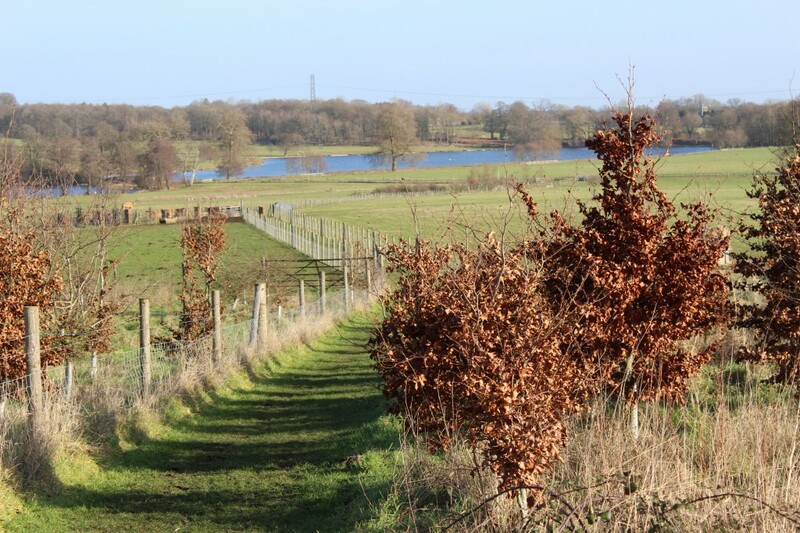 From here, we followed the driveway up past a redbrick lakeside mansion, before continuing on a grassy track through picturesque farmland (complete with Highland cattle) towards Tundry pond. 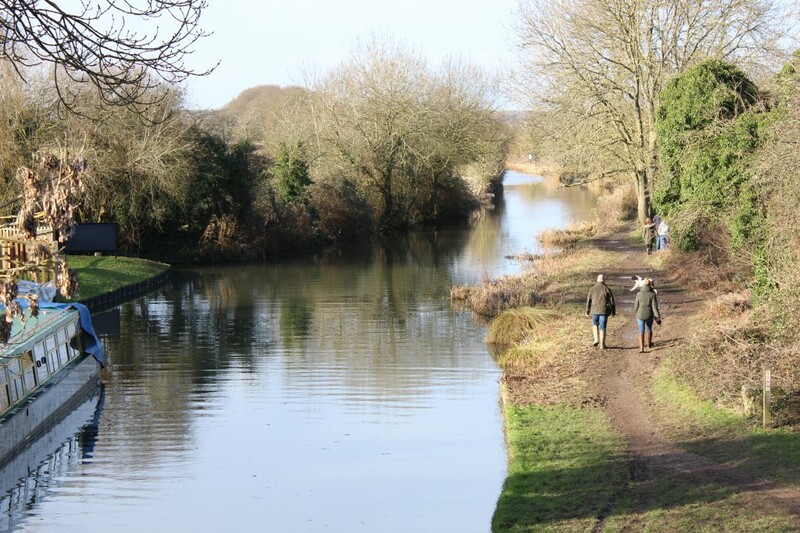 A few more fields and a lot more mud later, we emerged on the Basingstoke canal towpath, which we followed back to Odiham. Happy New Year! Yes, 2015 has arrived, and the weather in Exmoor has changed. 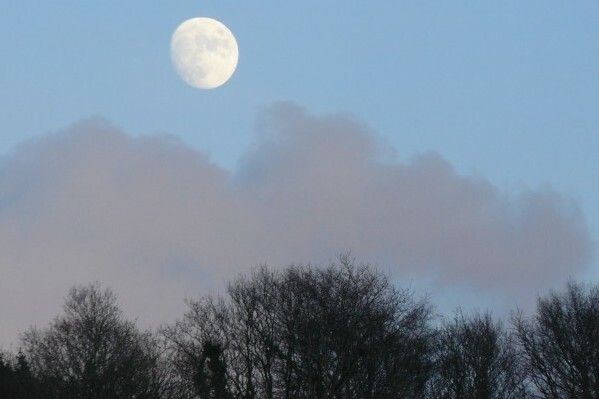 Grey clouds have replaced blue skies, a drizzly rain persists and the still calmness of recent days has been replaced with a howling wind. 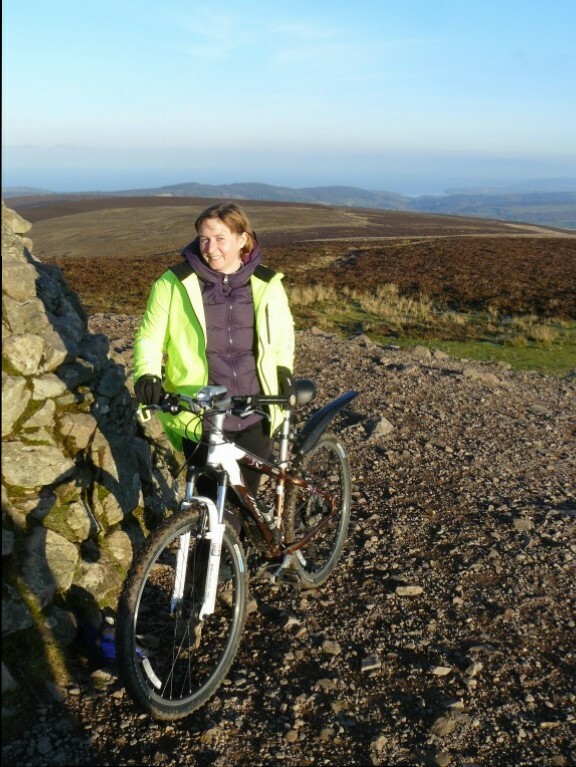 Over the past few days, we have cycled to Dunkery Beacon, walked to Selworthy Beacon and explored the Exe Valley. So, today we’re revisiting some of our favourite spots in Exmoor, and discovering a few new ones … by car. First on our itinerary was the 4.2-mile scenic toll road out of Porlock Weir towards Lynton, which we had not ventured along before. Part of the manor estate, the road was dug out by local people in the 1840s, and at that time tolls were taken at the bottom of the hill by staff at The Ship Inn. Today, approximately halfway up the hill, we reached a small toll house with a white wooden gate to drive through. With no ‘gate keeper’ in sight we posted our £2 toll through a slot in the toll house door. 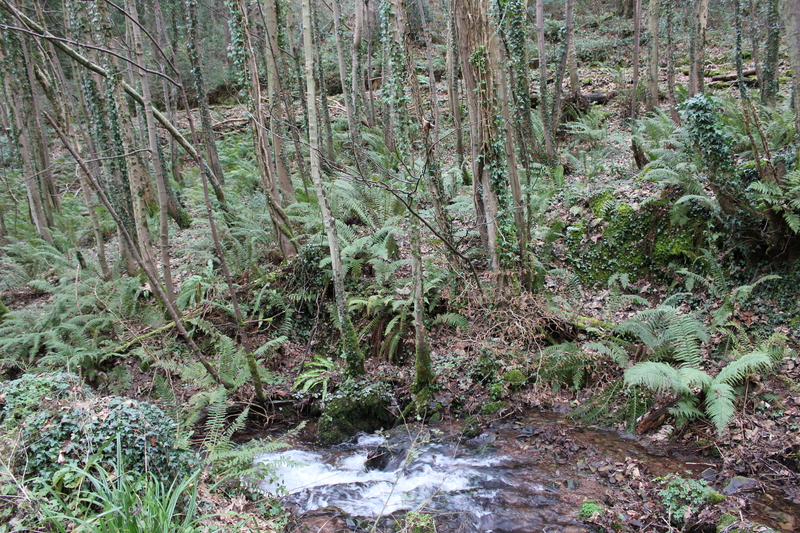 The scenic route then twisted through Tolkeinesque woodland of young ivy-covered trees, a carpet of ferns and a babbling stream bordered by mossy rocks, before emerging onto open moorland. We continued on past Countisbury, next stopping at County Gate viewpoint, a windy ridge between the East Lyn Valley and the Bristol Channel. The wind was so strong that I could barely open the car door, and found it hard to stand up straight. Despite the murkiness of the day, the views were still magnificent across to Southern Wood, and into the Doone valley. 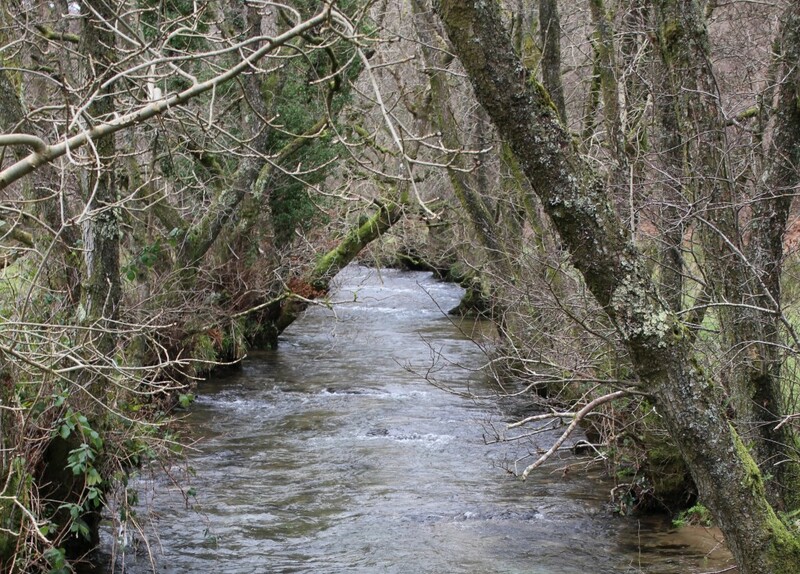 Next, we drove into Brendon, a tranquil picturesque village through which the East Lyn river flows. Then on up along the rocky tree-lined winding route past Waters Meet, through Lynmouth, up into Lynton and out to the dramatic landscape of The Valley of Rocks. 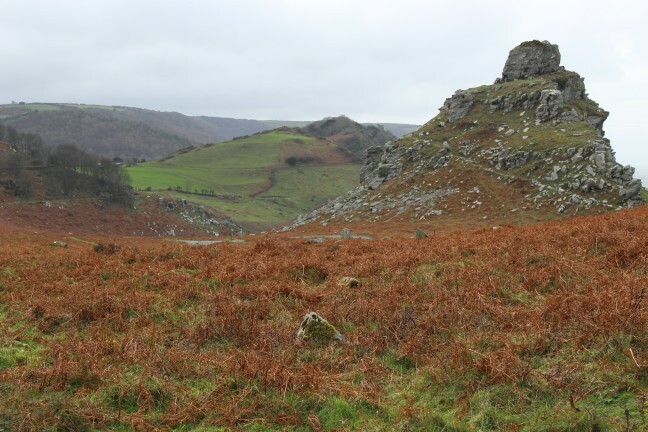 Perched high above the sea atop rugged cliffs, The Valley of Rocks gets its name from the many unusual formations of jagged grey rock dotted randomly throughout the valley, surrounded by bracken-covered slopes. Finally, we drove inland to Simonsbath, a tiny village in an area that the locals call ‘Exmoor proper’. 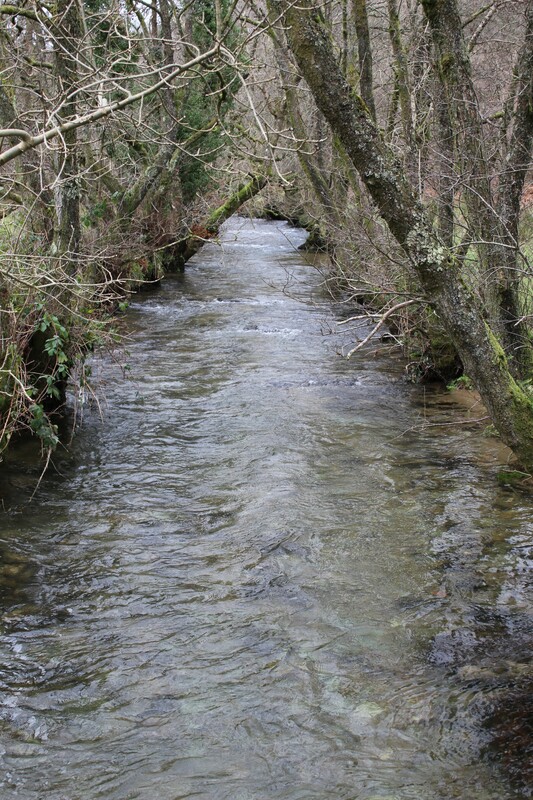 At its centre is a triple-arched medieval bridge crossing the River Barle. Travelling out from Simonsbath, we were soon enveloped by miles of moorland – bleak but stunning – where the grey cloud hung so low as to almost touch the top of the windswept tussocks of dry grass and heather. Hefty winds battered the the car, rocking it from side to side. 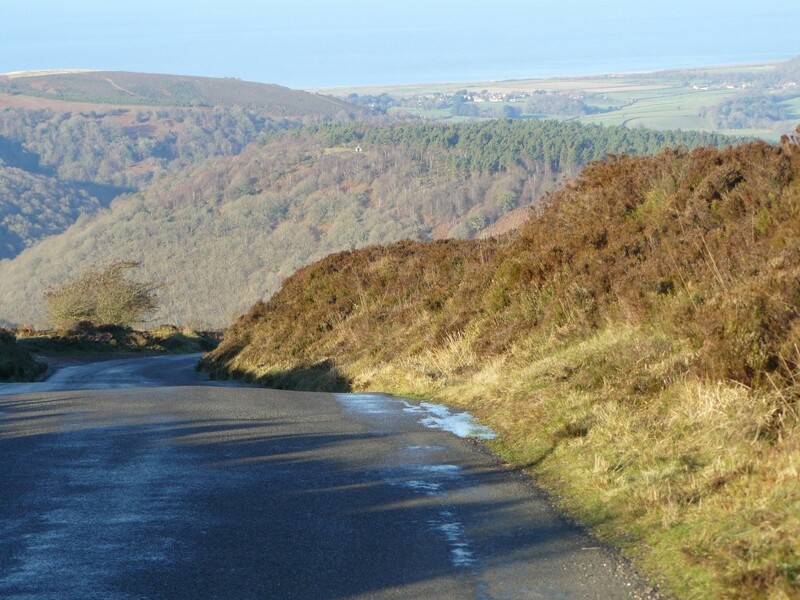 Finally, we headed north back to Porlock along long straight roads flanked by parallel beach hedges, still hanging onto their russet leaves, and single-track ‘character’ lanes, full of blind bends to test the bravest of drivers. As dusk fell, the wind still roaring and the rain now doing the driving, we retreated to sit by the log burner in our cosy cottage. 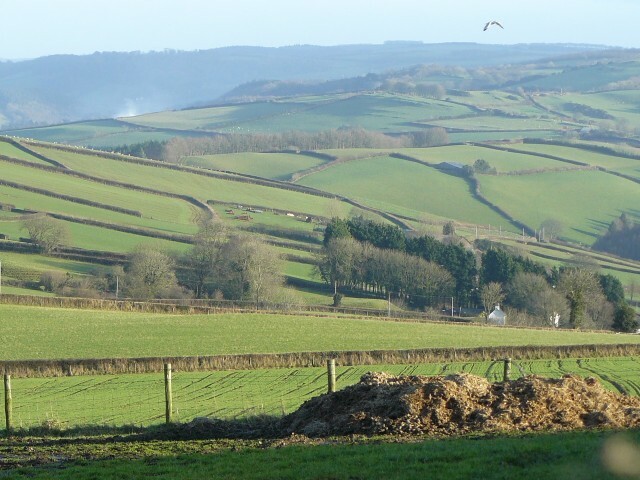 What are your Exmoor highlights? Please share them with others here. 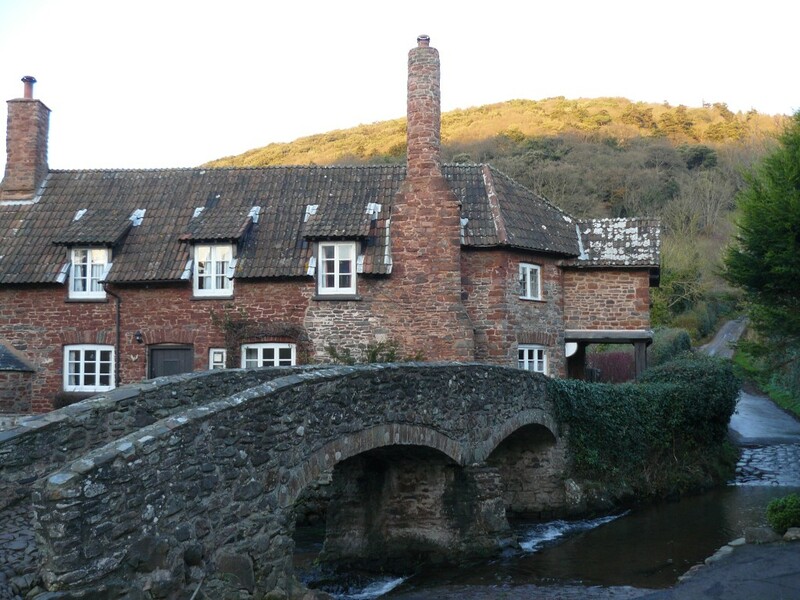 Exford is almost the geographical centre of Exmoor, and it is from this attractive village that we started our new year’s eve walk. At the far end of the village car park is the first of three kissing gates. Now, kissing gates are so called because the gate merely ‘kisses’ (brushes) the enclosure on either side, rather than needing to be securely latched, but I prefer the romantic notion that the first person to pass through has to close the gate to the next person and demand a kiss in return for entry. It was a good way to secure lots of kissing on the last day of 2014. 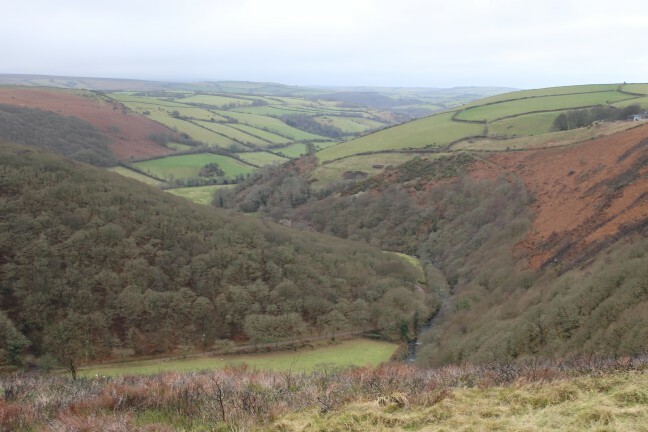 After the gates, it was time to head uphill again – well, a walk in Exmoor wouldn’t be a walk in Exmoor without a hill! Lots of mud and a couple of fields later, and once again we were enjoying those undulating Exmoor views – a patchwork of fields, hedges and woodland on the slopes of the Exe valley. 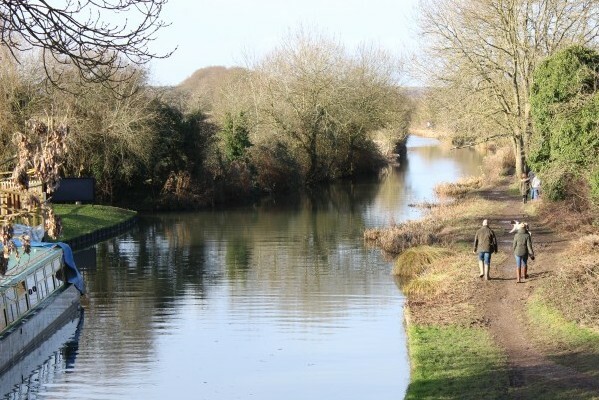 In a land where we we seem to have to fight for personal space, here is a corner of England where you can truly get ‘far from the madding crowd’ (well, in the depths of winter, at least). We only met two other people in 4 hours of walking. 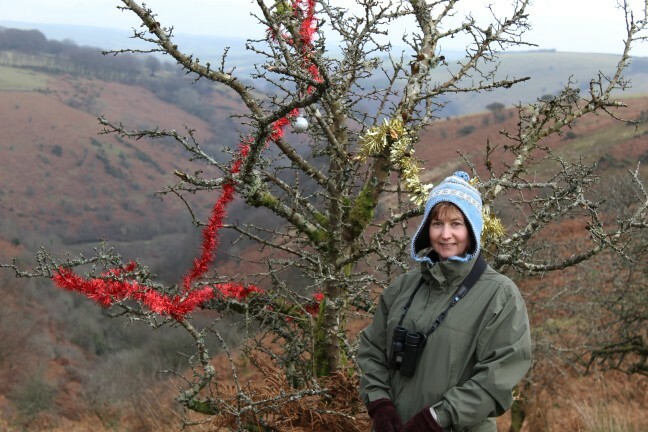 There must have been others up here recently though, as, bizarrely, someone had decorated a hawthorn bush with several strands of tinsel and a bauble, an incongruous sight so far from the bustle of civilization. 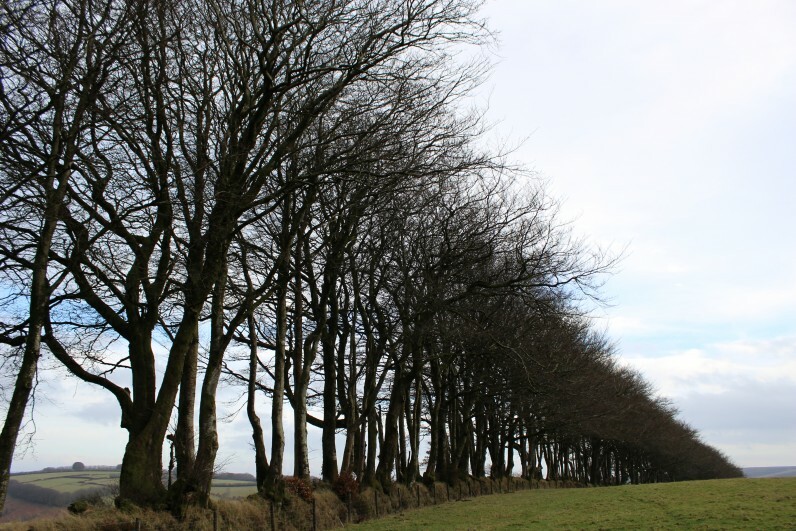 As we passed from field to field, down towards the Exe river, I was particularly struck by one of the boundary hedges, a gothic-looking line of dark beech trees, bereft of their leaves, growing tall out of a mossy bank and disappearing over the horizon of the field. We continued down to the Exe river, where we stopped for a very quick lunch. It was a rather bleak scene at the bottom of the valley. Grey clouds loomed and there were a few spots of rain, but that didn’t spoil our riverside walk, slopping around in mud. We climbed a few more fields, away from the river, which thankfully were frozen over or would have been pretty boggy. 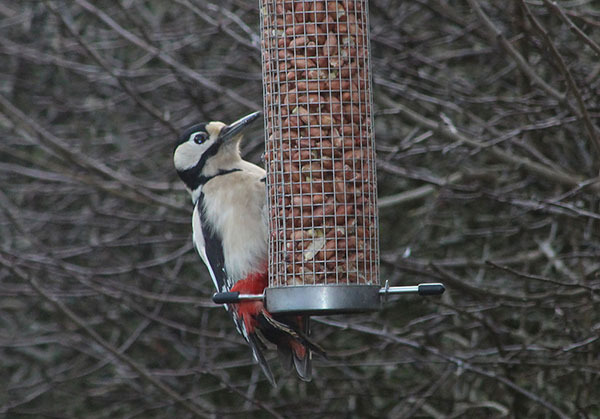 Nearly back at Exford, that just left three kissing gates to negotiate – a good end to the year!! Dunkery Beacon one day, Selworthy Beacon the next. 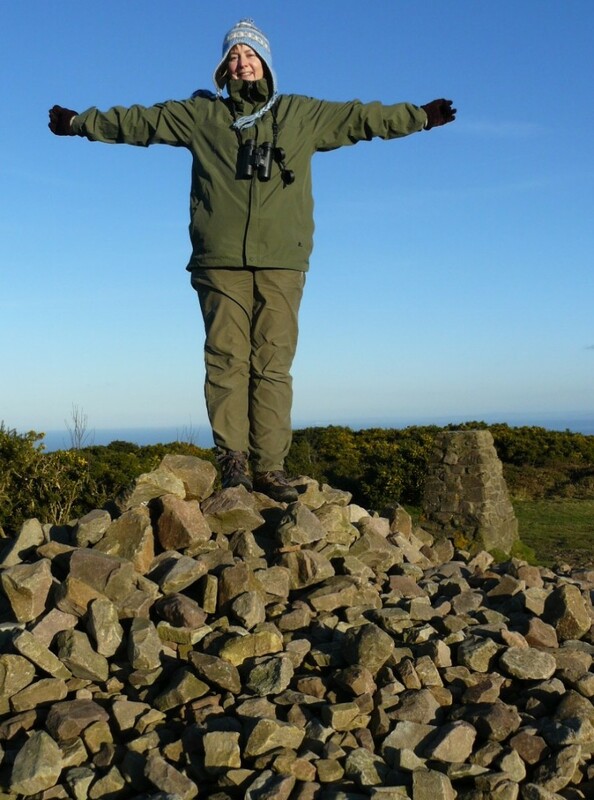 30th December 2014 dawned clear and bright over Exmoor, so we figured we might as well head high again, only this time on foot. We walked from Porlock down to the bottom of quiet leafy Bossington Lane, where Bossington Hill loomed ahead of us. From Bossington car park we crossed over a stream and into woodland at the foot of the hill. 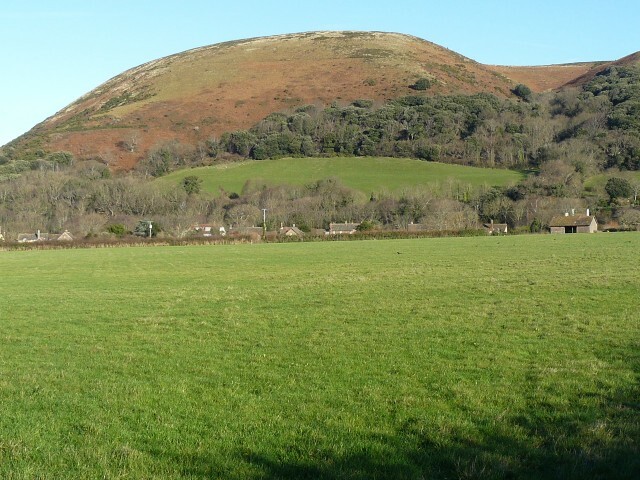 We climbed gradually, first through the trees and then past tufty grass and bracken around the side of Bossington Hill. Even at this height, we had fabulous views across the calm sparkling waters of Porlock Bay. Straight ahead of us was Hurlstone Point, but instead we began the ridiculously steep climb up the cleft between Hurlstone Point and Bossington Hill. 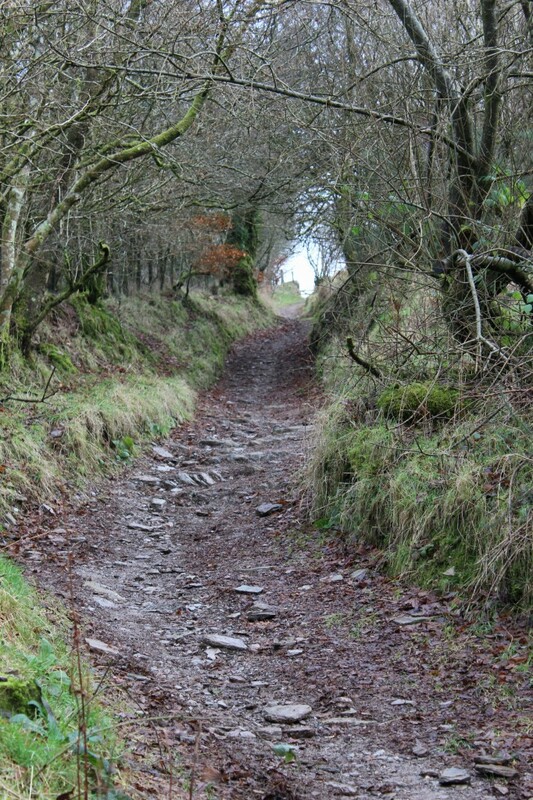 The path had been churned up by cattle, so it was hard-going in areas, but soon we could see the signpost at the head of the combe and made the final push for the top. It was then only a short walk further along the grassy top to Selworthy Beacon. We paused at the beacon for a quick bite of lunch, surrounded by huge gorse bushes in full winter bloom and fabulous panoramic views across the Vale of Porlock to the thickly wooded valleys and the moors beyond. The sound of galloping hooves alerted us to a small band of wild Exmoor ponies just down the path from us. We came out of the woods at Allerford, over the much-photographed packhorse bridge next to a pretty cottage. Built as a crossing over the River Aller (from which the village gets its name), the bridge is thought to be of Medieval origin. 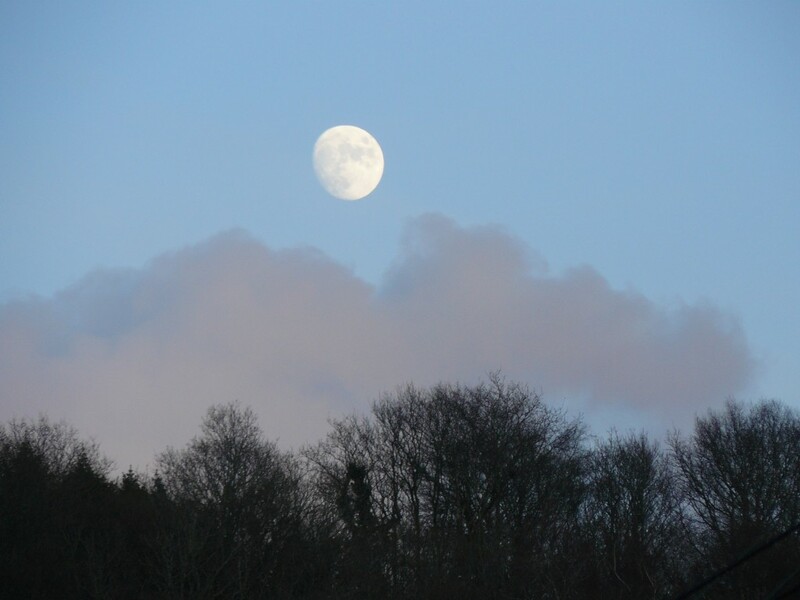 We were rapidly losing the light, as the sun had already disappeared behind the hills. From Allerford, it was a relatively short walk down to the 16th Century unaltered Lynch Chapel and back along the roads to Porlock, where we stopped at the Top Ship Inn for an early evening drink. “A beacon a day keeps a heart attack at bay,” according to my husband. 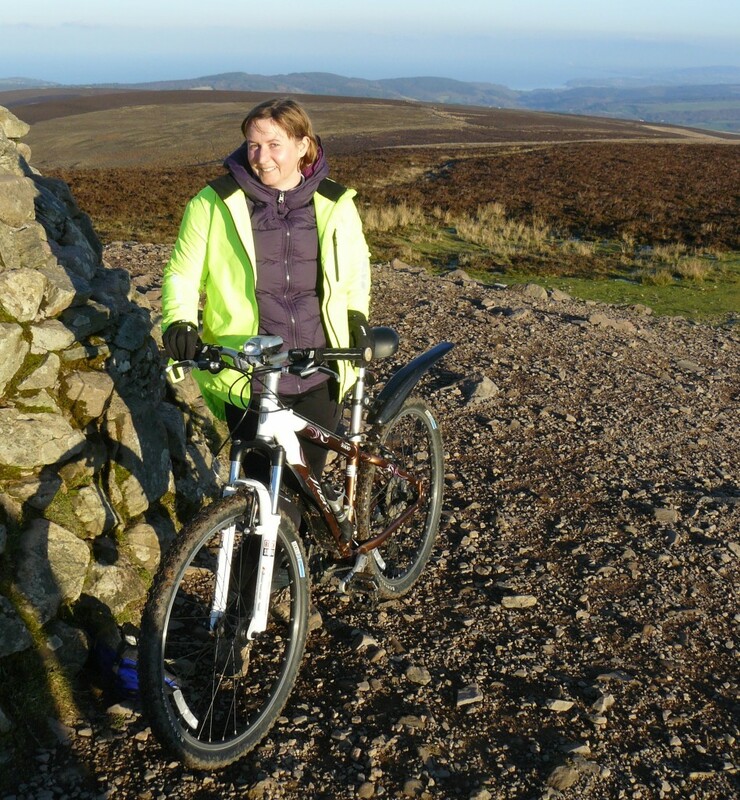 So, for our first cycle ride in Exmoor (29th December 2014), we didn’t just pick any old hill to tackle (and there are plenty of them around here). 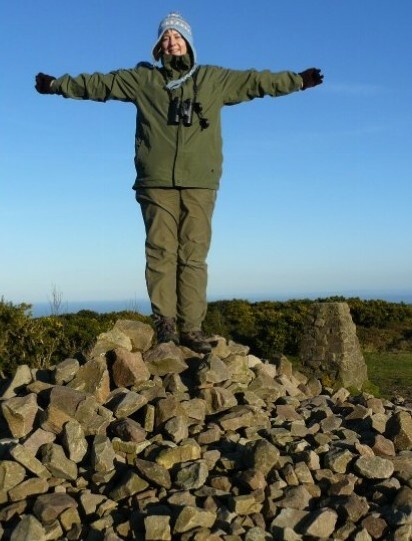 No, we decided to head for the highest point in Exmoor, indeed Somerset – Dunkery Beacon. Although I was hoping to break myself back into cycling gently (I haven’t been on my bike since the Alresford trip in October), it was a clear sunny day and it made sense to head for the beacon to make the most of the views. 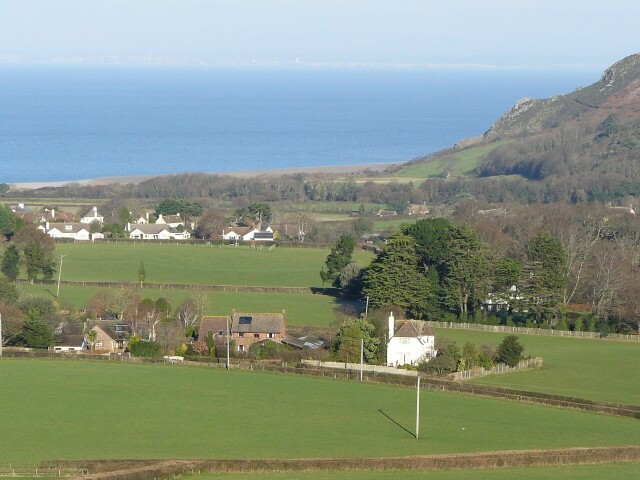 To get anywhere out of Porlock (our starting point), you’ve got to climb, and our efforts were soon rewarded with magnificent views over the Vale of Porlock and the Bristol Channel. 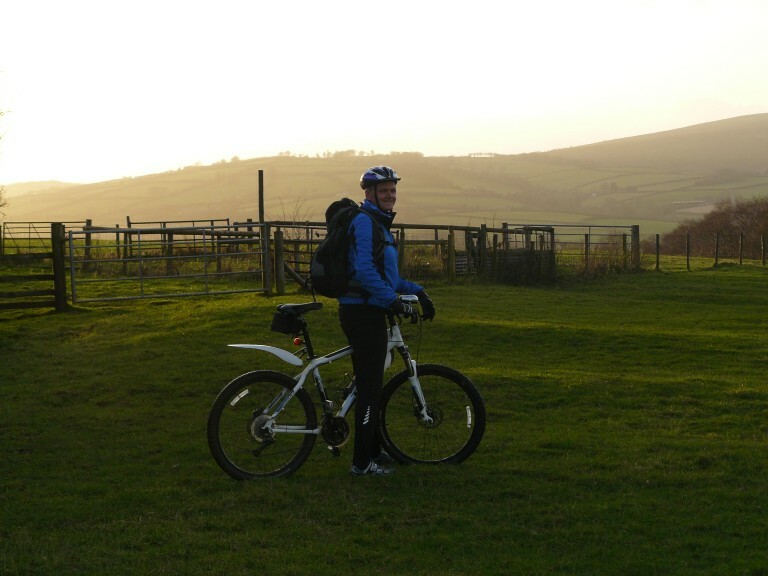 From then on, it was a tough slog along the road, through Horner Wood, up Dunkery Hill. We emerged from the trees onto a great expanse of heather-covered moorland, and still the road kept going up! By this point I was in the the lowest gears and my front tyre was lifting. I’d love to say I cycled all the way, but as the road got steeper there was a fair bit of pushing involved. Despite the winter sun, the higher we got the colder it became, and there were large patches of ice on shaded areas of the tarmac. 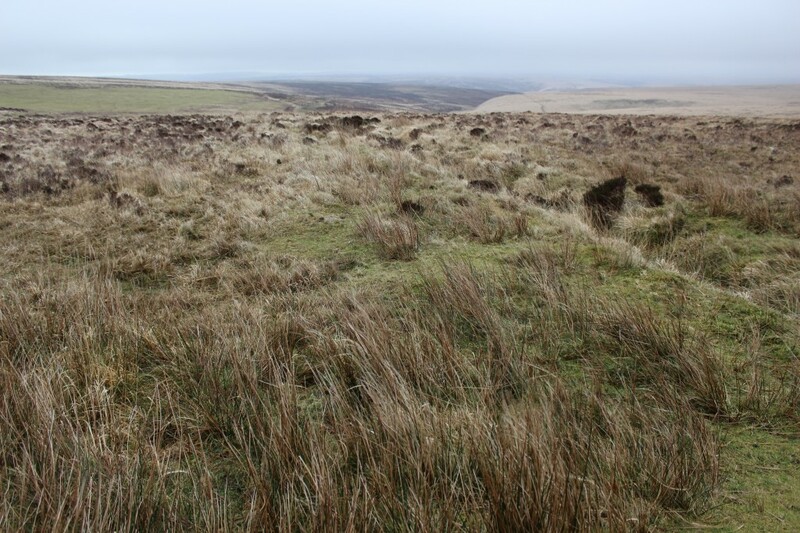 Eventually, we turned off the road onto a rocky track, and struck across the heather-clad moors with the beacon in sight – it is marked by a huge rock cairn and there were people crawling all over it. Ham sandwiches and hot vimto had never tasted so good. And the views were truly magnificent. But we soon started to cool down, and didn’t linger too long, heading onward along the rocky track for the circular route back to Porlock. The good news: it was all downhill from here. The bad news: the path was covered in sheet ice, and I hit it wrong. My bike went one way, I went the other. There were tears, there was blood, there was a hole in my cycling trousers, but apart from slightly less skin on my knees and a broken front light there was no real damage to me or my bike. Still, we could see that the downhill route was going to take us longer than expected, given the conditions, so we cut short part of the ride and took the road down over Wilmersham Common, with a steep descent down to Pool Bridge (really tough on the brakes!). We took it steady, as there was frost and ice all over the road. We then climbed back out of the valley and back down into Porlock for a much-needed hot bath and cup of tea. 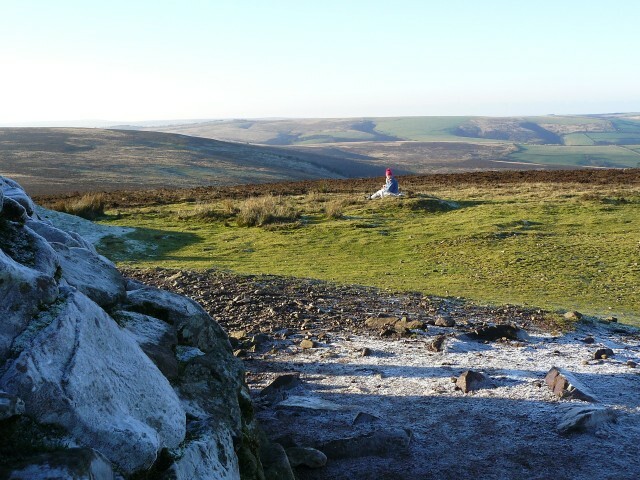 If you’ve walked or cycled to Dunkery Beacon, please share your experience below. Thank you.